"With Feldman, composing more and more takes on the nature of writing a diary; he weaves and knots his sounds like the Turkish nomads make their carpets, the ones he admires so much for their asymmetrical deviations in pattern." (Ulrich Dibelius) It is just these deviations from the standard, that which is slightly shifted, slightly out of place, that Feldman addresses in Crippled Symmetry, weaving it into one and a half hours of "chromatic color gradations" and rhythmic patterns reflecting this very "disproportion." In Feldman's words: "Thus, in a long composition, you will get through the whole range of possibilities sooner or later – there's plenty of time for everything." The piece was recorded in Munich in July 1994, non-stop in one go, without cuts. 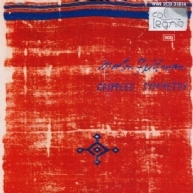 During two days Dietmar Wiesner, Markus Hinterhäuser and Robyn Schulkowsky played the entire work four times; the fourth interpretation is now released on this CD.